The Wildthings double trouble earring can be worn in different ways because they come in three separate parts. This ear cuff gives you double the fun to wear. The Earrings are minimal chic for every occasion. The Wildthings Galactic earring is a unique and statement piece with it's surprising spikes from the back of your ear. It can be worn as a basic ear stud or with the spikes on the back for the festive look. 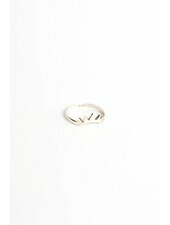 The Wildthings Empire ring is designed in Amsterdam and handmade in Bali. It is nice when you combine multiple Wildthings rings.